Recover sunken treasure with the Deep Sea Exploration Vessel! A shipwreck with a cargo of gold bars has been spotted at the bottom of the ocean. Jump aboard the awesome exploration vessel and head to the scene! This LEGO City model is loaded with the latest high-tech diving equipment. Activate the winch system to lower the exploratory submarine into the water. Climb into the shark cage and join the other divers deep below the oceans surface. Check out the amazing white shark, swordfish and octopus as you retrieve the gold bars from the sunken ship. 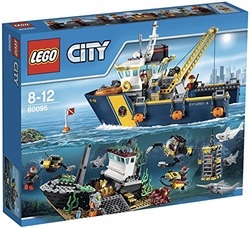 There's lots to play with in this comprehensive LEGO playset, including 7 minifigures: 2 crew members, 4 scuba divers and a deep-sea diver. The underwater elements include a submarine with domed cockpit, remote sub, scuba scooter, shipwreck with collapse function, shark cage, seaweed, swordfish, octopus, white shark and 2 grey sharks. The Exploration vessel features a working winch, large wheelhouse, below-deck cabins and a lifeboat. Accessory elements include 2 mugs, walkie-talkie, binoculars, life preserver, welder, 2 boxes and 16 gold bars. ﻿Exploration vessel measures over 19cm high, 31cm long and 18cm wide.